The basketball news headlines in Arras is Akonga-N'Simbo as the fifth player in the Ligue Féminine de Basketball this season to announce a pregnancy. Before the season started Bernadette N’Goyisa from Nantes-Rezé announced that she would not be playing this season. 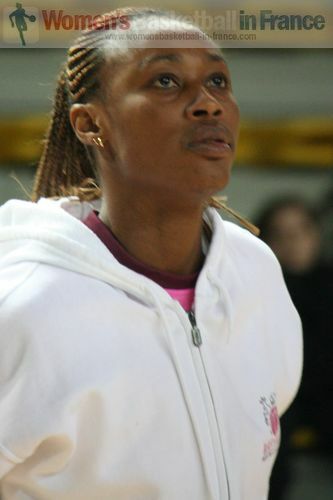 In September Elodie Bertal made her announcement that she would also not play this season. By the end of October it was the turn of Géraldine Bertal to put away her basketball shoes. In January Bineta Diouf-Diongue also called it a season. Akonga-N'Simbo has had problems with her knees all season, so her absence from the Coupe de France semi-final victory was due to a reoccurring injury. She then made a formal statement saying that she was expecting a child and will not be playing again this season. Arras' regular season ends on 11 April and then they have to wait five weeks until the French Cup final for their next game on 20 May. Akonga joined Arras in the summer of 2010 after 10 years of moving around Africa and Europe. Prior to Arras she played in Angola for two seasons with Primero Da Gusto (2002-2004), one year in Mozambique with Ferroviaro (2006-2007). Her European career started in Portugal with Olivais Coimbra (2007-2008). Then she moved to Belgium and played one season with Dexia Namur (2008-2009). Akonga also played internationally for the Democratic Republic of Congo between 2000-2005. However the highlight of her athletic career was her participation in the 2000 Olympic Games in the 100m and 200m sprint events.